Linen pirate shirt. Color: PURPLE. Sizes: STANDARD (fits up to 44 jacket size)and XLARGE (fits 44-46 jacket size). 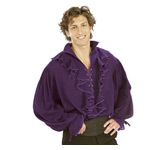 A beatiful pirate style linen shirt that will work great with any custom costume you create.